The loving, healing energy of the Akashic Records is a profound tool for self-exploration and empowerment. It is not a psychic reading but an opportunity for your soul growth. In the Records, you can learn about your relationships, your health, your soul path, and every other conceivable topic regarding you! Because the information in the Akashic Records is held in the energy of love, the answers you receive to questions during an Akashic Reading offer helpfulness and hopefulness as well as profound empowerment through knowing the truth of your situation and the possibilities unfolding in your life. Purchases 3 sessions for $285.00- save $25 per session! ​or click the link below to make an appointment online! ​1) Make a list of questions concerning the areas of your life that you are interested in asking about. Seven questions is a good number for one session. Feel free to ask questions and give feedback about the information you receive during the session. 2) You may like to take notes about the information you receive during your session. Have pen and paper ready. 3) It is a good idea to not use any recreational drugs or alcohol 24 hours prior to the session. 4) Allow yourself some quiet time after the session. Make sure to drink plenty of water as well. 5) Come to your session with an open heart and mind. The energy of Akasha is loving and gentle. The Akashic Records are a field of information of your life now and all previous lives and future possibilities. 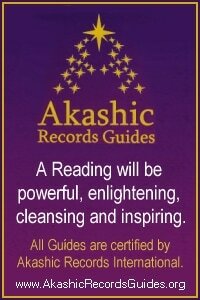 A trademark of Akashic Records "Readings" is that it is like accessing a library of information. Information about the Akashic Records can be found in folklore, in myth, and throughout the Old and New Testaments. It is traceable at least as far back as the Semitic peoples and includes the Arabs, the Assyrians, the Phoenicians, the Babylonians, and the Hebrews. Among each of these peoples was the belief that there was in existence some kind of celestial tablets which contained the history of humankind as well as all manner of spiritual information. The concept of the Akashic Records has been referred to in every spiritual tradition on the planet. In the Bible, it is referred to as the Book of Life. The Akashic Records are also referred to as the Cosmic Mind or Universal Mind, as well as the Eye of God and the Word of God. References in the Old Testament and beyond give us the sense that there is a collective storehouse of knowledge that is written on the fabric of reality. ​The Akashic Records contain every thought, emotion, action, and experience that has ever occurred in time and space. Your personal Akashic Records contain every piece of information regarding your soul’s experience. Questions regarding your finances, relationships, business, or health are all appropriate. If you feel some area of your life is blocked or that you cannot move forward in an area there may be a past life experience that is keeping you stuck - then this can be explored through the Akashic Records. Lots of times just awareness can clear the block. The record keepers are always gentle with any information given.